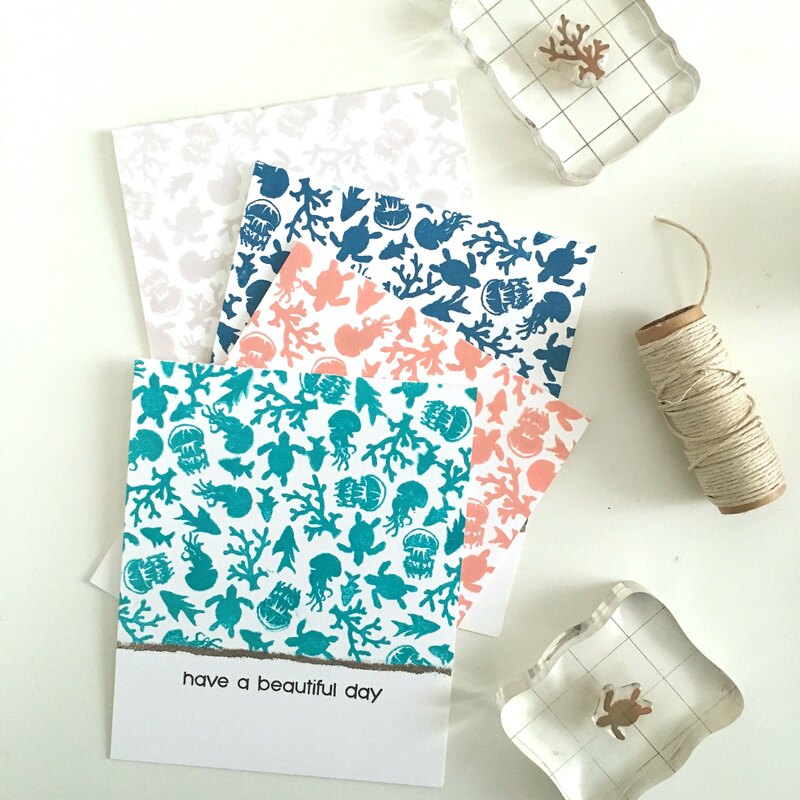 Here we are in the middle of winter and I’m making card sets with sea turtles and jelly fish on them. Probably because I’m already pretty sick of shoveling. I’m looking forward to warmer weather soon! 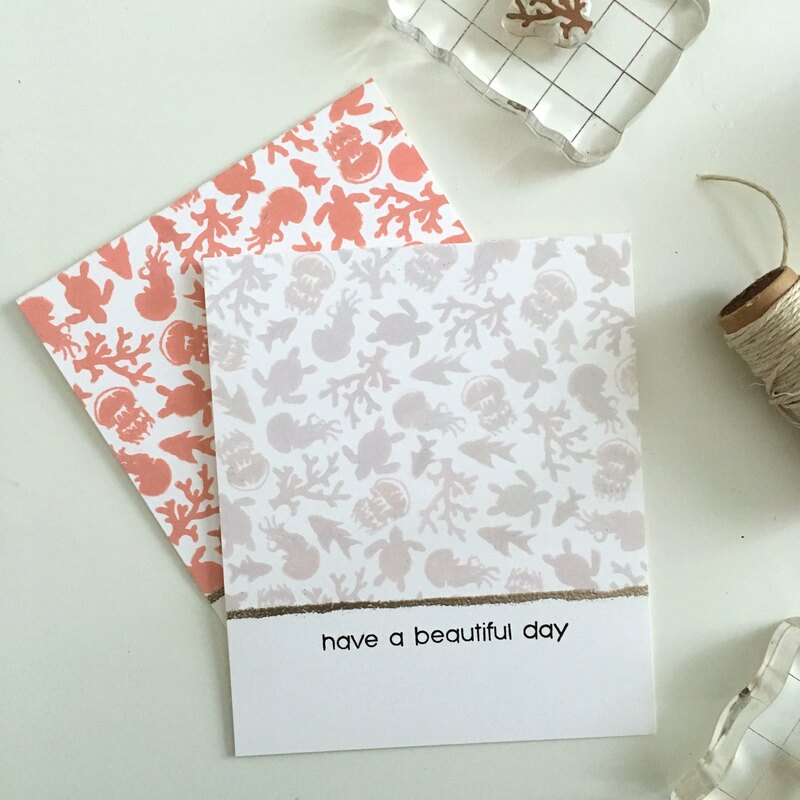 This set of cards is heavily inspired by a card made by Joan over at Dear Paperlicious. 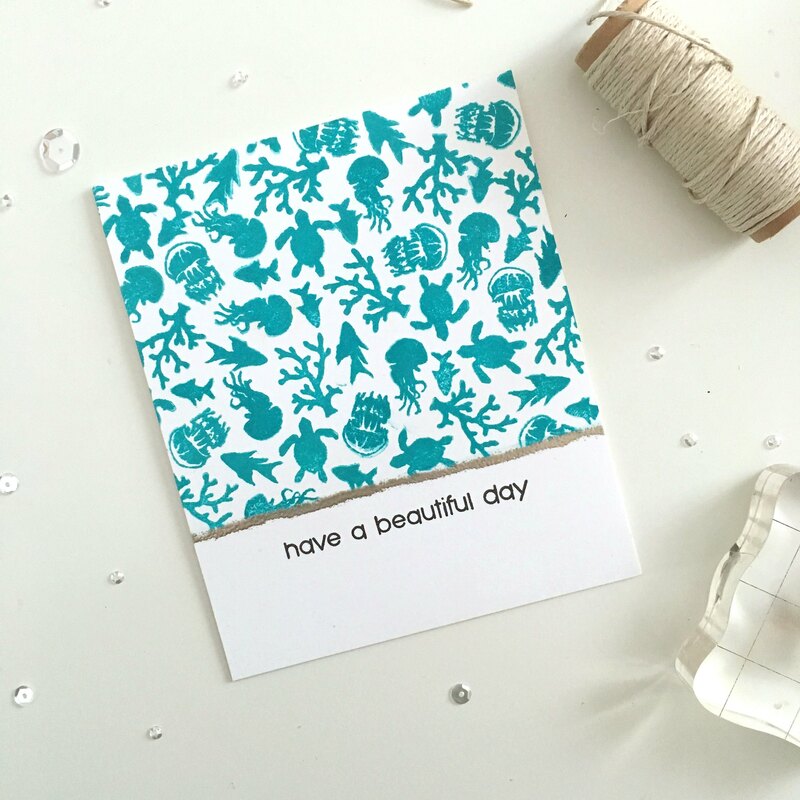 I recently discovered her blog and I love all of the cards she makes! When I saw the almost-one-layer card she made with similar stamps (with a beautiful cobalt-colored ink that I was wishing I had in my stash!) I couldn’t resist stamping a similar card of my own. I chose four colors of ink for the four cards I planned to make: Fog, High Dive, Soft Navy and Teeny Bikini. I then masked off my already-cut A-2 card bases with some painter’s tape, so that I could stamp my pattern but leave a large white space at the bottom of each card for the sentiment that I’d add later on. I loaded up some acrylic blocks with several of the smallest images from the July My Monthly Hero kit by Hero Arts (sadly, it’s now sold out – but this design will work with any small stamps!). I stamped all over the un-masked area of my cards and really packed those images in there! I made sure to clean off my stamps really well before switching to a different color for the next card. 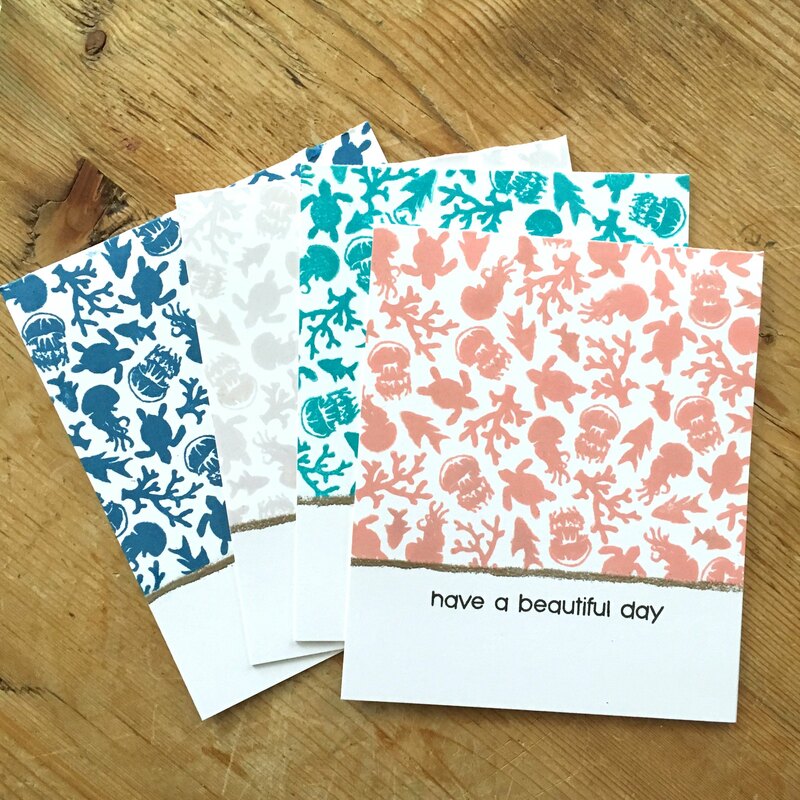 Although the process of stamping the pattern one image at a time was a bit tedious, I found it quite relaxing – which is probably why I made several of these! Once I’d finished stamping, I would remove the painter’s tape to reveal a nice white space on the lower third of the card. I wanted to delineate the space a bit more, so I used my VersaMarker and a ruler to draw a line across the card where the stamping stopped and the white space began. Then I added some Liquid Platinum embossing powder and used a dry paintbrush to brush away some bits here and there so the line was a little less perfect. Finally, I used my heat tool to emboss the jagged little line I had made, and I think that little detail helped to add some interest and balance to the card. I then found a very simple sentiment (also part of the July Hero kit) and stamped that in VersaFine Onyx Black ink below the line I’d just made. VersaFine ink is my favorite for stamping sentiments! I ended up chopping off about a quarter inch from the bottom of each card because I felt the white space I had left was a little too much, but there you have it! 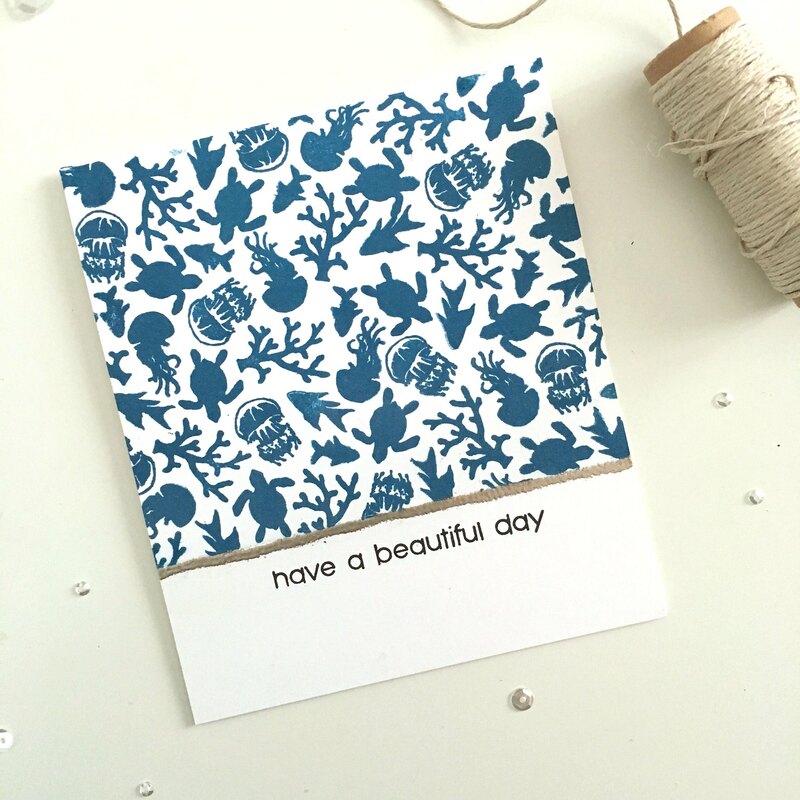 A simple one-layer card in a style that lends itself to any kind of little stamps – not just fish and sea turtles and coral! I think I’ll box these up in a set and gift them to a friend. I hope everyone is having an excellent weekend!